What is the correct placement of the device? Correct placement is important to ensure correct measurements. EXPAIN Change Neck & Shoulders should be plased on top of the muscle between the neck and shoulder. Place on the side where it hurts the most, or on the right side if you are right handed or left side if you are a leftie. 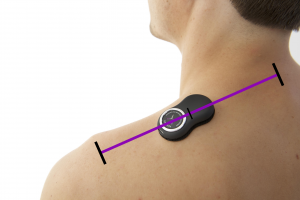 The Change device measure muscle activity by measuring small electrical signals on the skin. The electrical signals are created by the nerves telling the muscle fibres to contract. When several muscle fibres are triggred the signal gets stronger. This signal is picked up by the adhesive patches in the Change Neck & Shoulders and the conductive surface areas of the Change Arm. The electronics and microprocessor within the unit amplifies, processes and digitizes the muscle activity. It detects muscle activity and detects muscle rest and muscle activity. When the muscle is active for a sustained time period, 30 seconds, the unit vibrates to alert the user and reminds you to take a break. The time of vibration and time it takes to reach resting level is stored and transmitted to the smartphone when connected. How do I turn it on/off? The on/off button is inside the silver coloured ring. Press to turn on, press and hold until it vibrates to turn off (around 3 seconds). If nothing happen, the unit needs a recharge. It is vibrating a lot, what is going on? The unit vibrates hard to tell you that it is low on battery. Connect to a powered USB socket to charge. After an hour of charging, the unit is fully charged and ready to use. How long does the adhesive patches last? The adhesive patch last all day for around 10 days. If the patches loose some of its adhesive capacity the patch can be rinsed in cold water to refresh the adhesive capacity. If the patches are worn out and rinsing in cold water does not help, the patch is ready fore replacement. New patches can be bought here. Where do I place the armband? Correct placement of the armband is important in order to get correct measurements. 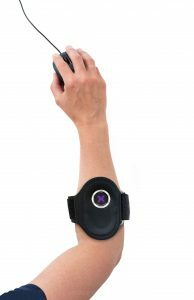 Place the armband at the thickest part of the forearm with the oval part of the armband over the muscles that are activated when the finger and hand is elevated. The button and USB-connector should be pointing down towards the hand. Does the Relax Legs run on battery? No, the device have to be connected to a wall socket to operate. Press and hold the on/off button to turn on. Press and hold to turn off. While on the button can be used to change hardness of the massage. How do I toggle between different functions? Different functions can be toggled by turning the inner control wheel. Align the arrow in the ring and function markings. Nothing happen when I press the on/off button? The device may need a recharge. Use the USB-cable to charge the device. The device may also be in safe-mode and the device exit safe-mode when connected to a USB power cable. How can I change the battery of the remote control? View page 9 in the user manual for instructions on how to change battery in the remote. The battery in the Back Up is charged with the included 9V connector and cannot be charged from a PC or similar USB-socket. Make sure the EXPAIN device is turned on and within range and rechargeable devices is charged. If no devices is found within 10 seconds, try to go back and re-enter the Add Panel page to restart scanning for devices.